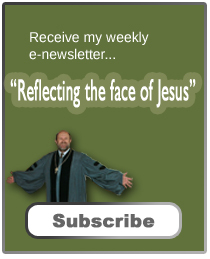 If you haven’t yet attended any of the Calvin January Series lectures, I encourage you to do so. 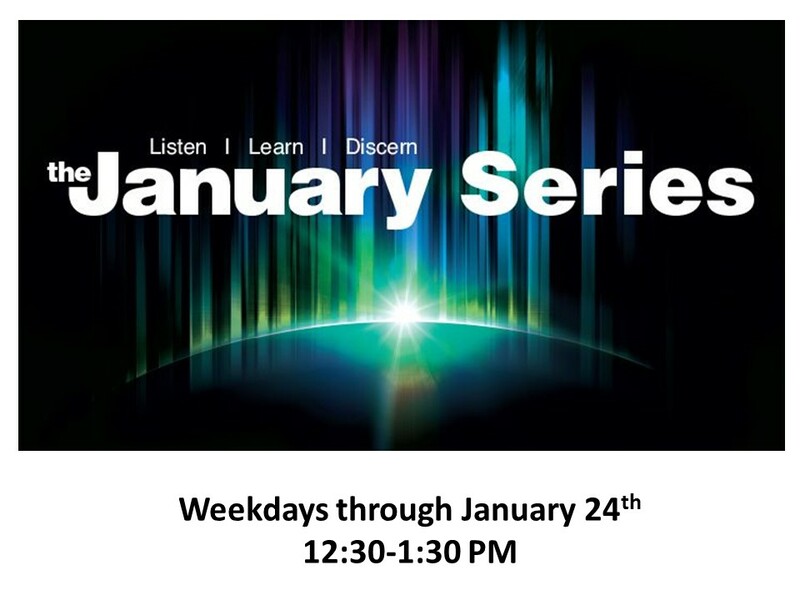 You don’t have to travel to Calvin College, for they are shown in Liston Hall, weekdays through January 24 at 12:30 PM. We have been blessed with many good talks on such a variety of subjects. This past Wednesday, the presenter was Gary Haugen, founder of the International Justice Mission, which is devoted to ending slavery in the world today. He began discussing how God could do everything himself, but chooses to use people to bring about his purposes in the world. He coined a term, “The Dignity of Responsibility.” I like that, “the dignity of responsibility.” He went on to point out how blessed the people of God are to have been given such a role to play in the world. That dignity of responsibility begins with our passage today, where God creates humanity in his own image. Thursday’s speakers were two lifelong friends, Justin and Patrick, who together did 500 miles trek of the Camino de Santiago between French and Spain. Lots of people have done this pilgrimage—thousands every year—but what made their journey special is that Justin had developed a paralyzing disease similar to ALS. He has no movement in his lower body and limited upper body movement. So his friend Patrick said, “I’ll push you.” He, along with friends along the way, helped push and pull Justin’s wheelchair along the path. Justin spoke of how hard it is to let other people help you; however, he’s dependent on such help. “When you deny someone the opportunity to help, you deny them the joy of life,” Patrick said. Maybe that’s an insight into why God created us. Sure, God could do it all, but has given us the dignity of responsibility, the joy of helping and of being helped. Last week we looked at the first six and a half days of creation, but I stopped reading right before the creation of humanity. We could be tempted to say that God saved the best for last and that the creation of a man and woman took so much out of God that a break was required. As humorous as it may sound, and I was trying to be funny, my joke misses the point. Let’s consider a few things from this passage. Although we are still creatures like the cows and other beasts, there are differences. First of all, God summons all of heaven, the heavenly court, to create humankind. Let us make humankind.” Who is the “Us”? Some argue it’s the royal we, others that it’s the persons of the Trinity, but there is little support in scripture for such interpretations. Instead, in the Hebrew Scriptures, there is references to the heavenly hosts, such as when Isaiah has his great vision. Unlike other acts of creation, when God speaks and creates or when God orders the earth to bring forth life and it does, in the creation of humankind, more effort is put into the act with the calling upon the heavenly hosts. Secondly, we are created in God’s image. No other beast gets this distinction; however such language was spoken in the ancient world. It was limited to just a few. Egypt’s Pharaohs were seen as being in the image of god as were kings in Babylon and earlier in Assyria. As I mentioned last week, this text, the creation story, was probably written down in its final form in Babylon and it is a text that upsets the Babylonian world view. The Hebrew people had a choice. If they accepted the world view of the Babylonians, their God appears lame and helpless. But this story undermines the violent creation myths of the Babylonians, giving the Hebrew people a reason to place their faith in the Almighty. God is all-powerful but cares for us enough to endow us with his image. 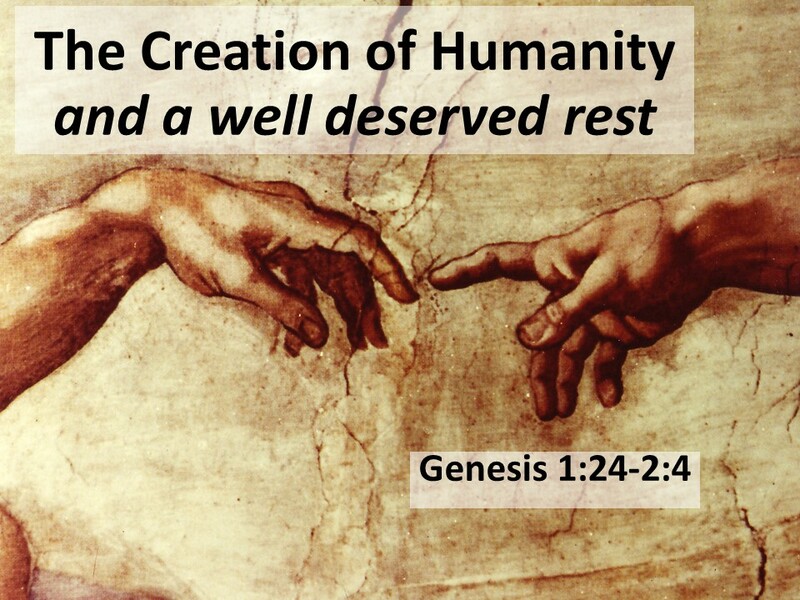 Another interesting thing in our creation in the image of God is that it’s collectively given to humanity. It takes both sexes, for God created humanity as male and female. You can’t exclude one or the other and still have God’s image. There is something powerful about this communal sharing of God’s image—for if we take this seriously, we have to admit that God’s image isn’t just in us and folks like us but in all people. The notion that all people, friend or foe, is endowed with God’s image should result in an ethic that honors everyone. Of course, we know that’s not always how we relate to one another, but if we did, wouldn’t the world be a much better place? For when I say or do something that denigrates another human being, it’s as if I’m slapping God in the face. Think about that, would we abuse God? No, we wouldn’t. But what about abusing a person made it God’s image? This fact should cause us to hold our tongue more often and to treat people, all people, with respect. A third essential part of our creation is that we are given dominion over the earth. There have been those who have suggested that this idea of dominion is the root of our ecological crisis. The problem with this view is how we interpret the word, “Dominion.” If we see such a word as meaning that we have unlimited rights to do what we please, then we can wreck all kinds of chaos on the world. But that’s not suggested in the text. In verses 29-30, we’re told that God gives all living beings, the human and the animal, plants for food. What’s implied (other than the fact that in Genesis 1, all creatures were vegetarians) is that we’re to share this earth and this food, not to hoard or misuse it. Another way of looking at “dominion” is through how kings of conquered territory were given “dominion” over a particular section of land. Herod was a king and he yielded quite a bit of power in Palestine, but his power was also limited for he ruled under and for the benefit of Caesar in Rome. Our position, the human position, of power within creation is similar. We’re to have dominion over the earth but we are responsible to God. We enjoy our position thanks to the God and for God’s benefit, just as Herod had to serve under the shadow of Caesar Augustus. God doesn’t give us the earth to do as we please; instead, we are allowed to enjoy the benefits of the earth during our lives, but the earth always belongs to God. We can also look at dominion through the eyes of a shepherd who watches over the animals in his care. In this way, we participate in caring for the world as God cares for us, as seen in Psalm 23, where the Lord is portrayed as shepherd. Or, we look at Jesus, the “Good Shepherd.” If you consider dominion in this way, it is not nearly as harsh of a view of how we relate to the world as some have made it out to be. After God created people and had sustained his creation, animals and people, with food, God hollows rest. There is a cycle throughout creation that provides for rest (we rest in the night and then go out and work in the day) but then the seventh day is set aside as holy. Throughout creation, God has blessed that which he has brought into being. Now a specific time is blessed, the seventh day which will become the Sabbath, a time to cease from work and rest and enjoy the benefits of our labor. 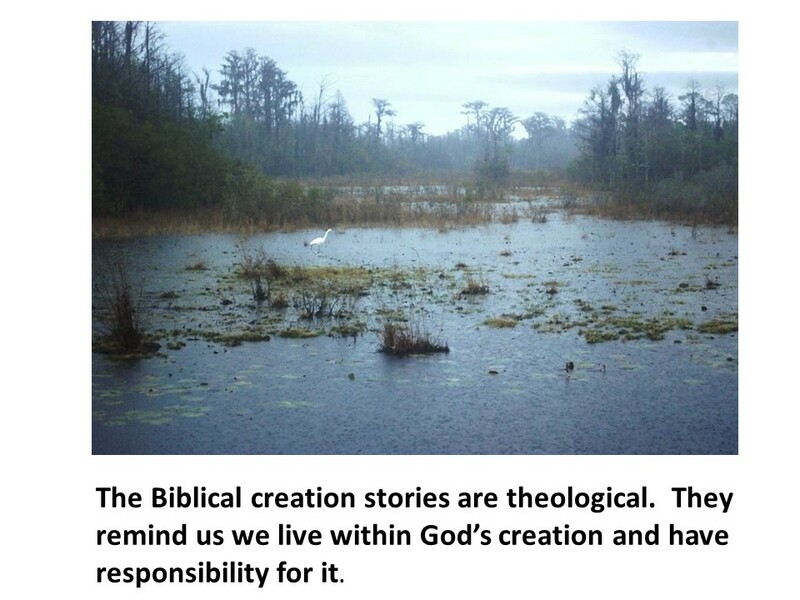 As I emphasized last week, the creation stories we have in Genesis 1 and 2 are not scientific accounts. They are both theological accounts. They don’t tell us exactly how God brought creation into being, but they tell us a greater “Truth,” in how God created and cares for the world. In the first creation story, we are given a picture of God standing outside of creation, but involved bringing it about. God creates a world and all that is in it. And we’re created and given a special place in this world. Yet, we are not to abuse our power. We are to use it to glorify and to give thanks to God who created us and who continues to love us, a God who created us to participate with him in Creation, by giving us the dignity of responsibility. Do we accept the dignity of responsibility that God has given you? If so, how do we participate with God in bringing about his purposes? Amen. Isaiah 6:8. See also 1 Kings 22:19-22 and Job 1:6ff. See Donald E. Gowan, Genesis 1-11: From Eden to Babel (Grand Rapids: Eerdmans, 1988), 27-28; Gerhard Von Rad, Genesis (Philadelphia: Westminster Press, 1972), 60. Gowan, 29. William P. Brown, Sacred Sense: Discovering the Wonder of God’s Word and World (Grand Rapids: Eerdmans, 2015), 27. Lynn Townsend White, Jr. “The Historical Roots of our Ecologic Crisis” Science (1967). See Gowan, 50 and Walter Brueggemann, Genesis: Interpretation, A Bible Commentary for Teaching and Preaching, Atlanta: John Knox Press, 1982), 32f.